PLS Blog: Last-minute gift ideas! How crafty are you? Say you don't have a ton of money. Or you want to show someone you care by making a handmade gift. We have several ideal Christmas gift crafts on the Pink Locker Society website. 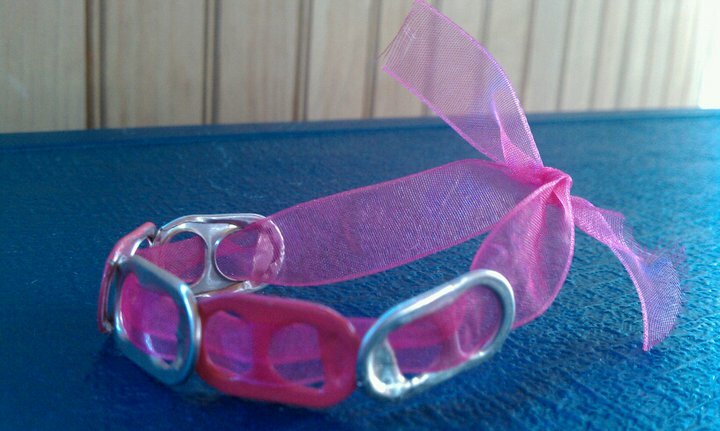 Some are super, super easy, such as Soda Tab Bracelets (also known as Pop Tab Bracelets). Who wouldn't want a pink bracelet like the one in the photo? Sarah, our Pink Locker Society craft instructor, shows you how to make one in this YouTube video. If you want colored tabs, you don't have to drink soda or energy drinks. You can easily paint a few silver tabs for a dash of color. Stylish! I have a soda bottle lid collection and i plan to make either a sort of picture by gluing them down on a big sheet of paper, or somehow stick them onto a belt or headband. well im not too crafty and gave the bandana purse to my molm she loved it sooo much she was overjoyed and i got a camera so it all worked out perfectly. That soda pop tab bracelet looks so cool!!! !